What do you think of this Angry Mama? Powerful non toxic microwave cleaning with all natural steam power. 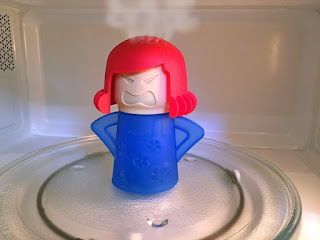 Even tough dried spots and microwave odors are no match for Angry Mama. Works better than a microwave sponge for cleaning stuck-on spots, splatters and spills. Microwave oven cleaner cleans disinfects and deodorizes with water and natural vinegar cleaner. Incredible steam cleaning at the push of a button. BPA-free.